NeoPixel lights can be strung together with only three wires: power, ground and data. This allows many lights to be chained together and individually addressed. 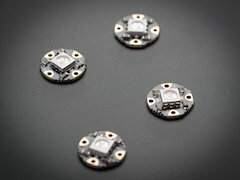 SEWABLE NeoPixels are just one member of a larger family of addressable, RGB Leds under the name "NeoPixel." There are other kinds of sewable LEDs, and other kinds of addressable RGB LEDs.